How Do I Create Scatter Plots in Excel Using SigmaXL? Open Customer Data.xlsx. Click Sheet 1 Tab. 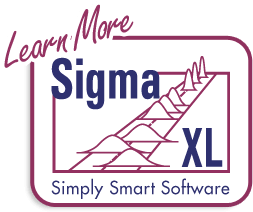 Click SigmaXL > Graphical Tools > Scatter Plots; if necessary, click Use Entire Data Table, click Next. 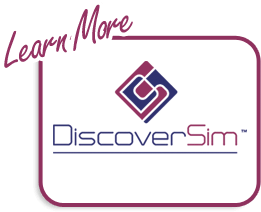 Select Overall Satisfaction, click Numeric Response (Y) >>; select Avg Days Order Time to Delivery, click Numeric Predictor (X1) >>. Click OK. The resulting Scatter Plot is shown with equation, trend line, 95% confidence interval (blue lines – for a given X value this is the 95% confidence interval for predicted mean Overall Satisfaction) and 95% prediction interval (red lines – for a given X value this is the 95% confidence interval for predicted individual values of Overall Satisfaction). The equation is based on linear regression, using the method of least squares. R-squared * 100 is the percent variation of Y explained by X (here 10.3%). 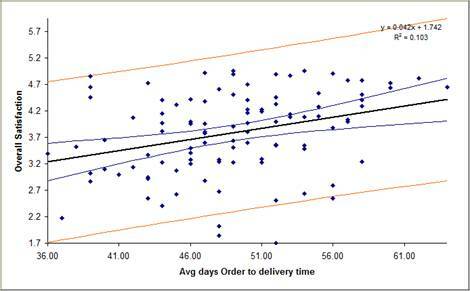 Clearly, according to the analysis, Customer Type 3 is happier if orders take longer! But, does this make sense? Of course not! Customer Sat scores should not increase with Order to Delivery time. What is happening here? This is a coincidental situation. Something else is driving customer satisfaction. We will now look at the Scatter Plot Matrix to help us investigate other factors influencing Customer Satisfaction. Tip: Be careful when interpreting scatter plots (and other statistical tools): Y versus X correlation or statistical significance does not always mean that we have a causal relationship. Umbrella sales are highly correlated to traffic accidents, but we cannot reduce the rate of traffic accidents by purchasing fewer umbrellas! The best way to validate a relationship is to perform a Design of Experiments (see Improve Phase).